Although the loss of hearing is bad at any age, it is particularly worse when it happens during infancy. Children need to hear in order to learn spoken language and to talk. Most children experience temporary, partial deafness when they have a severe cold that causes fluid to accumulate in the middle ear. However, if this loss is still there even after the cold subsides, the child should get checked for an ear infection. Still, there are many children who suffer from ear damage because of other reasons that cause abnormalities in the ears. What is Pediatric Hearing Loss? If they are unable to sit, stand or walk without your help. This is because the inner ear is responsible for balance. Conductive hearing loss – this is caused by an abnormality in the outer and middle ear due to injury or fluid accumulation. Sensorineural hearing loss – this type affects the inner ear or the nerves that carry sound to the brain. It can be present at birth or can occur during infancy due to external factors. Mothers also cause deafness to their unborn children if they have rubella, diabetes, cytomegalovirus, and STDs when pregnant. Pregnancy issues that cause lack of oxygen or blood transfusion can also cause deafness as well as premature birth. If there is a deafness gene in your family, a child can inherit this. Genetic disorders such as Down syndrome, ushers and Waardenburg’s syndrome also cause deafness in children. A condition called otitis media is the most common form of ear infection found in children. It is caused by bacteria-infected fluid accumulating in the middle ear causing inflammation and hence blocking any sound from going through.75% of all children get an ear infection at least once before they are five years old. This is common because the Eustachian tube in kids is very narrow and easily blocked. Viral infections are also a major cause of pediatric hearing loss. However, most children are vaccinated against these viruses. Meningitis is a life-threatening disease that affects the protective membrane of the brain and spinal cord. Meningitis can cause an inflammation of the nerve that connects ears and brain and causes hearing loss. If caught early, loss of hearing can be remedied by taking steroids. Unfortunately, deafness can also occur after treatment for meningitis so parents of such a child should carry out follow-up checkups to avoid this. Measles is a highly contagious disease that causes pediatric hearing loss among other complications. Measles vaccines are available in every country but outbreaks occur anyway and leave hundreds of children deaf, if not dead. This is a genetic disorder passed on to children by their parents. Type 1 usher syndrome causes severe deafness and vision at birth. Type 2 causes mild pediatric hearing loss and no balance issues. It is hard to detect this gene before a child is born because most parents are just carriers. Other causes of pediatric hearing loss can include chicken pox, mumps, head injury and exposure to very loud noise. Treatment of deafness is highly dependent on the cause. Some issues are easier to treat than others while some may even be permanent. The first step should be to get the cause treated and then take care of the ears. 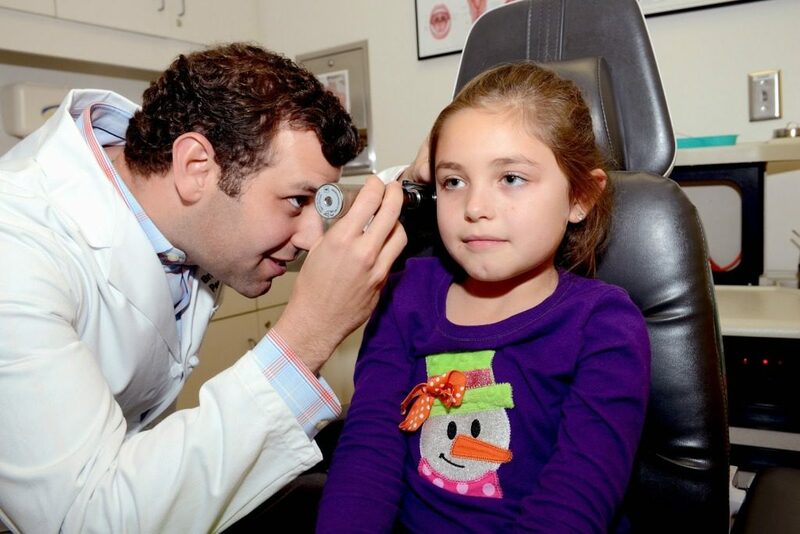 At Pediatric ENT Associates, we specialize in treating children with loss of hearing and other ENT issues. We will first do the necessary tests and action will be taken from there. A mild conductive hearing loss caused by fluid can be sorted via antihistamine and antibiotics that will clear up the inflammation and heal the underlying infection. Children who have had conductive hearing loss for more than three months despite being treated can benefit from ventilating tubes. These are draining tubes inserted to the eardrums surgically so fluid can be removed from the ear regularly. Children with malformations of the outer ear can also have reconstructive surgery when they are a bit older to have normal hearing again. Hearing aids are small attachments put inside or behind the ear to help children hear well. They are used in case of outer ear malformation. There are many forms of hearing aids and some come with a cover to make it hard for children to get rid of them. For those who have sensorineural loss of hearing, a hearing aid may not help much but it can improve their hearing. Because hearing aids are not very helpful when it comes to serious ear damage, cochlear implants have been approved for children over one year of age. They are tiny devices implanted surgically in the inner ear to stimulate the auditory nerve. These implants also have an external device that sends electrical impulses. These are devices that are used by teachers and mothers to speak directly to the child’s ear. A device is put on the child’s ear and the teacher has another one that they use to talk through. Pediatric ENT Associates are board certified and published doctors with many years of combined experience. We specialize in diagnostic, medical, and surgical care of head and neck related issues in children. In association with Children’s of Alabama Hospital, we give the best care to children suffering from airway obstruction, hearing loss and even neck masses. For any question regarding your child’s ear, nose, and throat, or to book an appointment contact us by calling (205) 831-0101. Any of our five specialists will give you the best care possible. Next, read Your Infant Has a Hemangioma. Now What?